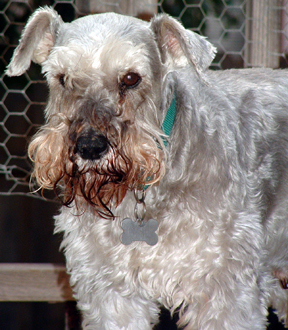 Tate was a wonderful Miniature Schnauzer with an awesome passion for life. He thought he was fierce but never fooled anyone. He had no fear (he should have feared raccoons), especially when we were there to back him up. He was a pheasant fighter and his worst fault, a chicken killer (just one very small one, I felt horrible). He really was a lover and player. He died the day he couldn’t play anymore (we should all be so lucky) and his 5 times as big playmate next-door still looks for him. Tate’s timely (he would disagree) passing gave me some inspiration, but this venture that honors Tate started as many do, with a passion for wine and ultimately out of practicality as we ran out of room for our wine. I was working at Wente and managing the family vineyard when Claude was assigned to me. We were digging ditches for irrigation systems. (Claude will say I was in the truck and he was in the ditch, but that was only true one time). One of the first things I was told was that he made wine at home. I had some grapes, so we made several vintages at his home. Soon he was so valuable to the company that he was stolen from me and ultimately has become a great small lot winemaker. We try to produce wines that express the great fruit of vineyards that I manage and that is enhanced by the wine-making process. Like a lot of viticulturists (vineyard managers), I used to think that great wine in made in the vineyard, and all winemakers can do is mess it up. I have come around to admitting that a good winemaker can add synergy to the ultimate finished product. While we collaborate on stylistic decisions, Claude is at the winery and generally does what he feels is the right approach for the particular fermentation or wine. We have tried to provide you with a wine that you will enjoy drinking with or without food, but we certainly encourage you to enjoy it with your friends and family at the dinner (or lunch) table. Please remember Tatedog as being named from love, made with passion, and fueled by necessity – and enjoy!